Having a sleeper even for a short while meant my normal good luck was back. So I was in a great mood. I left my luggage at the station and went to find the bus to the PSB Office where visa extensions can be obtained. The office has changed locations since the LP was printed so when the bus I expected to catch said no, I tried the next available bus, a No. 2. The answer was yes and I was told where to get off. The PSB Office was a few offices down. Not very far from the main train station actually. It was closed for lunch so I had some soup in a nearby restaurant while I waited. Once inside the office I was given the form to fill in, attached a photo and told to return the following Monday as it takes 5 working days. I pointed out that my current visa expired on Wednesday. No problem my 1 month extension was already in force! It was just a matter of paper work! It does mean that the first week will be spent waiting for my passport though. I guess I could go to another town in the meantime though as photo copies of the passport and visa are always accepted at hotels. The Hump where I am staying has wifi so the first day was spent catching up on the laundry, checking mail, organizing with Pieter to meet me here, doing some forward planning and continuing trying to complete the update of the website. 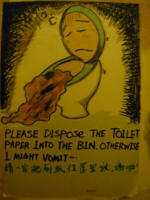 Loved the sign in the toilet. It happens too. The hostel is on the Golden Horse Memorial Archway Square. There are 2 archways and they are impressive. The staff could not tell me what the arches were a memorial for! I visited the Yunnan Nationalities Museum which has the responsibility of protecting and collecting ethnic relics of cultural, historical, scientific and artistic value. Yes this blurb is a précis of the museum advertising. 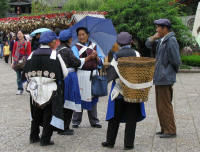 Yunnan has the highest number of ethnic minorities, 25 in all. The museum has collected masks, Wa Dang (ends of the roof tiles), water dripping triangles that go between the Wa Dang; agricultural equipment, household utensils and models of houses. There is a Yi dump cart used to move water upwards, rather like a flat water wheel. Houses are made of bamboo, wood, mud or in a courtyard style. The bamboo houses are cool with good ventilation, earthquake, flood, worm and damp resistant. The wood pole houses provide protection from the cold and are earthquake resistant. The courtyard houses are best for wind resistance while the mud houses are good for insulation in hot, cold or dry climates. The mud houses are also the cheapest and easiest to build. 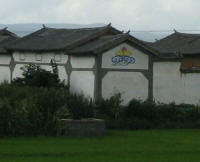 All of these types of houses can be found in Yunnan. There is a section on making paper from bark by the Dai. The bark is stripped from the trees, soaked in water, boiled, rinsed, beaten to pulp, spread on racks, dried in the sun, smoothed and polished and finally removed from the rack. It is quite thick and the process is still in use today. Nearby is a section on paper cutting. There are some very delicate pieces, beautifully cut. The musical instruments covered many flutes, whistles and pipes made from bamboo, gourds, pottery and horns. There were also drums, gongs, cymbals, bells and a tuning fork. There were various clothes from around China. Then there is the language section. Here the exhibition starts with rock carvings, embroidered designs and tattoos that tell the story of the culture. It covers various ways of sending messages using feathers, leaves, small arrows, knots in rope and wood carvings. For example two leaves with their backs together means 'go away, I don't want to see you again'. Lastly it covers writing in stone and on paper in the various written languages e.g. Yi, Dai, Bai, Man and Mongolian. There is a bible from the Lisu that uses roman script. Presumably from the missionaries translating it into the local language. Pieter and I visited the Western Hills beside Lake Dian. They are full of walking trails and dotted with Taoist Temples, pagodas and some villas. The paths are railed with proper steps, reasonably smooth paths and many rubbish bins. I just love the emphasis on cleanliness. There were also various places to stop for a drink, a snack or a souvenir. Dragon Gate Reserve at the top of the hills is a group of grottoes, narrow corridors, temples and pavilions hacked from the cliffs between 1781 and 1835 by a Taoist monk. We wanted to avoid too much walking as Pieter has problems with his thighs so we took buses, a minibus and a road train to the entrance of Dragon Gate and walked up from there through the reserve to the cable car. If we had taken the cable car first we would have walked down to the road train. I don't know which is best, going up with the strain on the thighs, or down with the strain on the knees. The cable car took us down to the main set of souvenir stalls and eateries, then we took a second cable car to the opposite side of the lake. The tomb of Nie Er is near the entrance of Dragon Gate. Nie Er (1912-1935) is famous for writing the Chinese National Anthem. As a young man he played the piano, the violin and female parts in plays, obviously skilled musically. There is an exhibition showing his life and excerpts from his diary. The one I like best is dated 5-3-1930 after he had joined the Communist Party. I have not improved the English translation but you can still understand his sentiments. "Whatever National Party, Reform Party, Nationalism Party declare from the people, for the people but actually they lie to the people". And the Communist Party? Did it never lie to the people? The lake is being cleaned up but it is full of algae making green swathes over the water, quite artistic but I doubt it is good for the fish. There is a lot of housing development along the lake, personally the condition of the lake would put me off. I did see one pleasure boat though. Certainly swimming and recreational fishing is out. All in all it was a pleasant day's outing and it did not rain until we were back at the hostel. We went to the supermarket across from the hostel and it started to rain while we were inside. By the time we came out it was pouring down, but the staff of the complex had already put down cardboard and were handing out plastic bags to hold the wet umbrellas. Very well organized. When there was a break in the rain I went for a walk to the East and West Pagodas. In themselves not very interesting but the realistic statues are amazing. The scenery was superb, what we could see of it between the tunnels. Lots of high green hills with isolated farms, small villages and large towns. We arrived early in the morning and immediately went to bed. Sleeping on a train is never as relaxing as sleeping on a bed that does not rock. 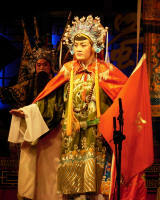 The Opera at the Shu Feng Ya Yun Teahouse that evening was fabulous. When we arrived we were escorted to seats with tea cups ready for hot water. An attendant came around with a teapot with an enormously long spout so as to reach the 5th tea cup from the aisle. She was pretty accurate as well, hardly spilling a drop. The performances started with a musical recital using traditional instruments, followed by an opera with elaborate costumes. The stick puppet show was amazing. The puppeteer could make the puppet roll its eyes, pluck flowers from a pot and put it in its hair, toss and catch scarves and much more. The hand shadow show was just as amazing. The artist could make all sorts of creatures with his hands, a bird which eventually took food from his mouth, a rabbit, a dog, spider, owl, cat, galloping horse and finally a rabbit being caught and eaten by a dog. There was a play where the husband came home drunk and his wife made him perform all sorts of tricks with a lighted oil lamp on his head. The most impressive was the Changing Faces. One performer changed not only his mask but his complete outfit in the blink of an eye. He would stand in front of screens and hold a flag in front of himself for a few seconds then slowly lower it revealing the new outfit! It was like magic. He must have had helpers behind the screen. Others used fans or small flags to cover their faces while the mask was changed somehow without assistance. Again all in the blink of an eye. Absolutely amazing! I did visit Wenshu Buddhist Temple from the Tang Dynasty (618-907 CE). There were many Buddhists visiting the temples. Religion is certainly alive in China. Unfortunately the rain that dogged my stay in Kunming is here as well, although here it is muggy not cool. This rather dampens my enthusiasm for sightseeing. We had soft seats on the train as it was a relatively short journey. So much nicer than hard seats. The main differences are formed seats, preventing other people from pushing in to sit more than the specified number of people and no standing passengers wanting to push in. The train arrived earlier than we expected. Pieter has several items attached to his main luggage which he had to remove to fit it on the luggage rack. When the train stopped he had to put it all together again. This takes time but it was the last stop. Even so I stood on the platform waiting for him and watched the train doors close. My only thought was - what if the train moved off with him still on board? It didn't and an attendant opened the door especially for him. We were last out of the station and because we had booked ahead were met by a CITS (China International Tourist Service) employee and taken to the hostel. The hostel was new and we were the only guests. The beds were HARD. The bottom was a piece of board with a thin mattress filled with sheets of cardboard! Needless to say we did not get a good night's rest. The city is built on a peninsular where the Jialing River meet the Yangtze. This means that to get anywhere you have to climb lots of steps if you are on foot, or zig zag up and down if you go by road. There is lots of construction going on, mainly of tall apartment blocks. China is growing and fast. The next morning we were again picked up and taken to the CITS Office from where we would leave for the boat. Before going to the boat we visited the 3 Gorges Museum which is free for foreigners on a Friday. They have actually cut rock from the gorge and displayed it in the museum to illustrate what is now covered in water. There is an exhibition of the Ba people. Fossils have been found from the Palaeolithic Age, through the Neolithic to modern times. They ask the question in English ' Was Africa the cradle of man or China?' There is no answer in English! The Ba people had quite a strong culture around the Yangtze before they integrated with the plains people of China during the Western Han Dynasty (206 BCE to 9 CE). Since it was lunch time and the bus to the pier at Wanzhou would take some hours we found the American West Cowboys Restaurant for lunch. Hotpot is a speciality in the area. This is a large bowl of boiling water in which you cook your meat, vegetables and noodles. The Cowboy Restaurant used a hot plate instead. It is done on a buffet style where you choose your ingredients and then fry them. You could have as much as you wanted with fruit for desert. Lovely! NB: The Yangtze River is 6,300km long, the longest in China and third longest in the world. It is navigable from Yibin in Sichuan, 2713 k, providing, with its tributaries, the longest navigable stretch of river water in the world. The Three Gorges Dam, once full will be the largest in the world. It is 185m high and 2k wide in a straight line. There are locks to take ships from the dam side to the lower river and vice versa. The boat was not quite what we expected. We were in second class which meant a 4 bed room with a very small attached bathroom. And I had asked for third class originally!!!! At least the standard meal was cheap, tasty and filling. The passengers were mainly Chinese with 1 Indian man and a young Dutch couple besides us. The boat left almost 2 hours late and consequently the first tour to a temple started at midnight. We did not go on the tour but almost everyone else did. When they returned they were full of laughter and talk. I had set the alarm for 5:30am to see the first gorge, Qutang Gorge. This is the shortest and narrowest of the gorges. It took half an hour to pass through. The trip up the 3 Little Gorges (Misty gorge, Emerald gorge and ?) followed. This meant a change to a smaller boat. Here the sides were steeper and the river much narrower. To ensure it was memorable we also went on a tour of Dachang Ancient Town from the Ming and Qing dynasties, one of the ancient sites that have been relocated above the expected new water level, and a short excursion on an even smaller boat where the guide gave a long talk, sang some songs, presumably boatman songs and provided a photo opportunity. Through out the 4 hour trip the main guide kept up a patter of talk, all in Chinese. I don't know how she managed to find so much to say. Back on the main boat we sailed through Wu Gorge and then Xiling Gorge. Pieter and I slept through Xiling Gorge! It used to be the most difficult of the gorges. Boats going up stream had to be pulled by men walking on the shore. Going downstream boats had to watch out for rocks. These pathways and rocks have long since been covered by water and the going is much easier. The last morning there was another excursion up Jiuwan Stream. Once again Pieter and I gave it a miss and rested on the boat. It seems we missed out on seeing some acrobats performing on a high wire over the stream. Finally at about 12:30pm the boat reached the dam and we disembarked. Most passengers went on a tour of the dam, no doubt all in Chinese. Since it was 4 hours to Wuhan we also gave this a miss. The bus trip to Yichang was uneventful. We had expected to have time for lunch here but ended up with 15 minutes before the bus to Wuhan arrived. Potato Crisps and water for lunch! This bus driver was slow and coasted most of the time. He almost rammed into a stationary truck. Great! We had to catch a taxi to the hostel where we were booked. The brochure said 6 Yuan. The first taxi driver wanted 20 Yuan and had no meter. The second had a meter and although he indicated 15 Yuan, we indicated the meter. Pieter actually started the meter but the driver stopped it. When we arrived Pieter gave him 10 Yuan. He was not happy and almost had a physical fight with Pieter, but in the end went off. He should be happy, after all the money is not recorded so it is pure extra. He also learnt that not all foreigners are easy targets. We read and generally relaxed. Our train tickets were purchased by the hostel which saved us the hassle. We did not realise until we were at the station that we were in different carriages because the train was full, at least they were next to each other. We arrived at the station expecting to be picked up. When that didn't happen we looked for the bus as per the brochure and could not find it. It was then that we realised we had arrived at the North train station and not the main train station. At least that explained why the taxi drivers were asking such a high price. We caught the bus anyway and were put down where we could catch another bus. The driver of the second bus indicated he knew where we must get off. Eventually he told us to get off but the hostel was no where in sight and no-one could tell us where it was or where we were. Three taxi drivers did not know where the hostel was even though we showed them the address in Chinese and it is near the Sheraton. One person told us there was a hostel around the corner. It was then that we realised we were at the main train station and had actually passed the stop we should have alighted. We caught the bus back and eventually arrived at the hostel. It had taken us two hours instead of 30 minutes! Neither of us were happy chappies. The room is spacious though and the hostel is near lots of shops and restaurants. We had intended to spend the first few days seeing Guilin however another couple, Ron and Julie, were looking for two people to accompany them on a speed boat down the Li River to Yanshou. We were going to do this trip anyway so we decided to join them. The speed boat took 4 people only with 3 in the back seat and 1 in the front beside the driver. It was actually just a boat with an outboard motor but the driver knew the river well and where we would want to take photos. He always slowed down at these places. Julie climbed into the back seat and I followed, going to the other side so Rob could sit next to her. I was told to move to the centre as I was the smallest and the boat needed to be balanced. This has never happened to me before, I have always been one of the largest! It was quite a pleasant surprise. The trip was great. The scenery at the start is not very interesting but eventually we reached an area where there were plenty of the limestone karst hills. The hills are formed out of large areas of limestone which are then weathered by rain and rivers into fantastic shapes. They are full of limestone caves as well as the strange shaped hills. It is fantastic scenery even through the rain. Yanshou is very touristy but set amoung the hills. We will probably return and stay there for a few days. As it was we had some lunch and caught the bus back to Guilin. Rob and Julie were staying in Yanshou for a few days. I tasted a green ice lolly made from peas - an interesting taste. I also tasted the seeds of a strange looking fruit, these tasted like fresh green peas as well. We spent one day at the hospital as Pieter had a pain in his chest which was not going away. The diagnosis is coronary atherosclerosis heart disease (cholesterol lining the arteries) and he has been given pills for it. He will have to rest for a few days so I will be sightseeing on my own. Then it was the opening of the Olympic Games. We watched the entire opening ceremony while having dinner. All the restaurants had big screen TVs to ensure they attracted customers. We decided to stay until South Africa, Holland and Australia had entered the stadium. We left when we could see the size of the Australian delegation only to discover when walking along the street that the next group was China (the host country always comes last). The Chinese were cheering and clapping enthusiastically. It is a HUGE delegation. We rushed back to the hostel to watch the hoisting of the flag and lighting of the torch. They have done a fantastic job. It meant a very early morning to bed and a late morning getting out of bed followed by a lazy day. We spent many hours watching the Olympics while Pieter rested. The emphasis was on the events where China was participating naturally, especially repeats of those performances where they won gold. They are doing exceptionally well. 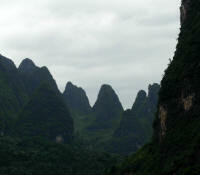 There are many karst hills around Guilin which can be seen from the top of Solitary Beauty Peak or Fubo Shan. Solitary Beauty Peak is at the centre of a 14th century Ming Dynasty palace. Only royals and high status dignitaries were allowed to climb the peak. It is now both a University Campus and a tourist spot. Sun Yat Sen lived here for a while when fighting the Japanese. There is a monument to him. Quite something because as far as I remember he was anti communist. There is a Confucian Temple, Xuanwu Pavilion, near the top, built there because of a natural formation showing a turtle and a snake. I am reasonably sure no-one follows the Confucian religion anymore but all the Chinese tourists were told how to pray. This they dutifully did and purchased a blue ribbon to tie to the chain link railing. Superstition is alive and well in China as else where. I did not climb to the top of Fubo Shan, one peak is enough on a hot humid day. In any case the attractions here are the Buddhist images dating from the Tang and Song Dynasties (6th and 10th centuries) carved into the walls of the interlinked caves underneath the peak. We returned to Yangshou as it has such lovely scenery even though the town is a complete tourist trap. Walking around we were constantly accosted by touts and sales people. I suppose this is the way they make their living but it can be annoying when they refuse to understand 'no'. Last time we were here I had tried a strange fruit from which seeds were extracted and eaten. 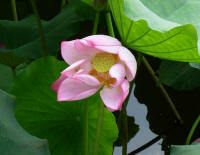 I now know they are water lily seeds. We found a large pool of them growing in town. They are obviously a crop. We did, of course, make use of the facilities available. We hired a scooter instead of bicycles to go along the Yulong River, a tributary of the Li River. We joined lots of other tourists, mainly on bicycles. This included many tandem bicycles. The LP had said to take water and snacks as there was very little along the way and it is a dirt track.. The track has been paved and there are quite a few freezers with cold water etc along the roadside. Probably because it leads to places where you can take a bamboo raft down the river. Bamboo is a misnomer. The rafts are made of metal pipes shaped like bamboo and painted black. Bikes are transported by truck to the landing place. 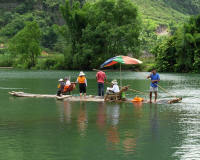 The bamboo rafts and boatmen are transported upstream to the starting point in the same trucks. It was a lovely outing even though we could not go all the way on the scooter as the road does eventually turn into a rough dirt track. Usual journey, some of the scenery was interesting though. The start of a traumatic week. Pieter had pain in his chest just walking from the platform to the taxi stand. Once we arrived at the hostel he could not carry his bags up the stairs, I did it for him. Then he had to sit while I booked us in. I went off to the PSB where visas are granted and was very pleased to be given an extra month. Just as well as it turned out, although I am sure I could have asked for a special visa under the circumstances. Next morning the first stop was the People's Hospital less than 2 minutes walk away. The distance to the hospital was slightly longer than the distance to the road and a taxi, so we walked. Pieter had to sit once on the way and again when we reached the main hall. I went off to find someone who could speak English. This was a very nice young man from Admin named Frank with excellent English. We explained the problem and he took us to the emergency section. Initially Pieter was asked to sit but there was only one chair so I sat to sort out the admin while he lay on a bed. Within seconds he was moaning and crying with the pain. The staff went into full action. Monitors suddenly appeared and were hooked up while a nurse injected morphine, his blood pressure was taken, a drip set up and I don't know what else. There were so many people busy doing something. All I could do was stand out of the way near his head and provide moral support. Pieter was asking why he wasn't given something against the pain so a second injection of morphine was given. I doubt he even felt the first. It took a few minutes before the pain reduced sufficiently for him to relax. Then came the admin, completing forms with name and current address. I also had to sign a paper, as the only family present, that I understood he was seriously ill. Apparently this is a legal requirement. The family is important in China and throughout his stay in hospital this was constantly reinforced. The doctor wanted to admit him. This meant more forms plus payment for the emergency treatment and a deposit for the hospital stay. Luckily we had the money immediately available, Pieter had quite a bit on him and his ATM card, although I am sure they would have accepted payment later. He was taken up to the ward and hooked up to monitoring equipment. His shaved chest (from Guilin) came in handy. There was a drip constantly in his arm. They had put in a needle which was never removed. It had a plugged end which was cleaned with antiseptic when one drip was removed and another inserted. There were also regular injections in the stomach and pills to take. The nursing staff looked after all of this. 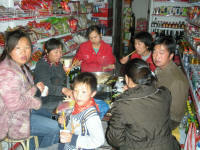 Any other needs had to be taken care of by the family or perhaps, in China, the family insists on doing the other tasks. All the other patients had plenty of family around, at least one person from 7:00am to about 9:00pm. They could not really understand why Pieter was left alone so long. By the time Pieter was admitted and I was free to go it was past checkout time at the hostel. They were very good about it though and I moved from our double room to a dorm, settled in and promptly went to sleep. The emotional stress, standing around all morning and dashing around taking care of the finances had all taken its toll. I had to be up though to take Pieter his dinner and some toiletries. I had asked if he needed pyjamas and was told he would be given a pair so did not worry about that. While Pieter ate I removed the container of bodily waste. The family has to take care of everything that is not medical! He had not been given pyjamas either so I said I would bring something suitable the next morning. Pieter had slept most of the time and was not very hungry. It only occurred to me on Wednesday that the best way to ensure I ate at a reasonable time was to take enough for both of us. Wednesday I slept in a little, sorted out the washing and handed it in, ordered take-away from the hostel and had some breakfast myself before going to the hospital. Apparently the nurses were really surprised that no-one was there at 7:00am to wash Pieter. They brought some water and he had to wash his own face. I had to empty the bowl. This was all a very new experience for us. He had not been allowed to even raise his head, although he insisted on standing to urinate. At least that did not bring on any pain. He changed into the shorts and top I had brought which was much more comfortable that his long pants with a belt. A few of the patients had hospital provided pyjamas but most were in their street clothes. One or two had their own pyjamas. We were told that Pieter would have an operation that afternoon, an angiography (to see the coronary arteries in detail) and surgery according to the findings. This would probably be the insertion of one or two "stents" to widen the artery/arteries. There was a 10% chance of a bypass. I had to give permission for the doctors to perform the operation, as a family member. Pieter also had to give permission as the patient. Since Pieter had only eaten half his breakfast, he finished it for lunch. I was about to return to have some myself when I was told the operation could start within an hour. I hurried back to the hostel to hang up the washing and then back to the hospital. A case of hurry up and wait, only for 45 minutes though. Pieter was taken through to the operating theatre in a wheelchair and I waited in the waiting area. There was a screen showing his operation. I could see the arteries and veins but it meant very little to me. After the operation was complete one of the assisting doctors who could speak English came and took me through the procedure. I could then clearly see the blockage, the poor result when they tried a balloon and the good result when the "stent" was inserted. This is all part of ensuring the family is fully informed. Pieter came out of the theatre in hospital pyjamas, made for a Chinese size man, short legs and only one button could be done up on the top. Thursday I was up earlier and took enough breakfast to the hospital for two so I would not be too late. This time the nurses knew I would eventually come and wash him which I duly did. He was very tired and slept most of the day, so did I.
Friday he was discharged. Once again I only changed rooms after book out time and once again the staff were very helpful. We were both glad he was out of hospital. He because the ward was noisy and he could not sleep all that well. Me because the constant to-ing and fro-ing was at an end. We both slept in on Saturday, what bliss. He now must take a handful of tablets every day, keep to a low cholesterol diet and not over exert himself. The last is going to be the most difficult. Saturday I finally had time to have my laptop fixed. It is an Acer TravelMate and less than a year old. There is a 1 year guarantee but no agents in Kunming. The problem was that the 'a' no longer worked. This laptop is obviously not very robust. I was told where to go by the hostel but was thoroughly confused when I arrived at the street where lots of repair shops were supposed to be. There were none to be seen. Luckily I met a retired British man who spent 6 months in China and 6 in England. He spoke adequate Chinese. Unfortunately he also could not find a repair shop. So he asked the manager of an Internet Cafe. The manager knew of a repair shop and took us there. They wanted me to buy an external keyboard as they could not fix the problem. On to the next place. They showed their competence immediately. They knew how to remove the top of the 'a' button, something the previous shop had difficulty with, in fact I had to show them how! They tried to get an a to show both with and without the top, obvious first steps which I had already tried. They concluded that it was the circuit that needed repair and they could do that. They removed the basic keyboard, sufficient tops to allow proper access, and tested the circuitry to find the problem area. Then a small bottle of silver liquid was produced and the damaged circuit painted over. It worked! I was fascinated by the concept that you could just paint in a circuit - with the correct liquid naturally. Since Pieter was healthy if not very energetic I decided to see Tiger Leaping Gorge. Pieter would not have been able to cope and lazing around in Kunming waiting for him to recuperate would have driven me crazy. I took very little with me and left 90% of my luggage with Pieter. The first stop was Dali. The road wound through green hills and cultivated valleys. The buildings were painted white with a grey trim at the sides. Pictures mainly in grey were painted on the white area. This is typical Bai culture. The Naxi, further north at Lijiang add some colour. 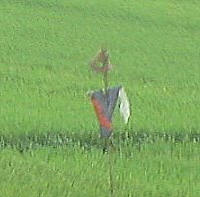 The fields were decorated with flags and scarecrows making a colourful sight. Large stones were for sale. These are used as garden decoration or placed at entrances with inscriptions on them. The Chinese appreciate rocks and stones for their form and colour. The bus stops in Xiaguan (Dali New Town). To get to Dali Old Town you must catch a local bus. The bus routes have changed since the LP was written so it took a while to find the right series of buses. The terminus has also changed places so once I arrived at Dali I was completely disorientated. However with lots of help I found the street I was aiming for. The hostel I had chosen no longer existed, just a sign and half demolished building! Any way there are lots of places to stay and I found a nice hotel. The town is touristy but it would have been nice to stay a few days and go out into the country side. Dali is on the edge of a large ear shaped lake Erhai Hu, 1900m above sea level, about the same as Johannesburg. On the other side of Dali are the Cang Shan (Jade Green Mountains) soaring another 2,000m up or 4,000m above sea level. Magnificent setting except is was cool, misty with a fair amount of rain. Historical Note: The Bai settled in the area around 1,000BCE. In the 8th century they established a kingdom which exerted influence over a wide area including northern Myanamar. The Mongols finally took over in the 13th century. This is the off season for trekking the Gorge because of the rain so I was not sure if I would be able to actually do the trek. There is a trekking path up high and a paved road below. Even the paved road can be closed by landslides during this season. In any case I organised a horse (turned out to be a mule) for the next day with the Jane at her Guest House. Dinner was eaten with the family. I thoroughly enjoyed it as I doubt I will have another opportunity to eat what a Chinese family prepares for itself. There was lots of rice available of course but also a soup made with a green vegetable, meat (yak?) with vegetable, a potato dish, a vegetable dish made with a leafy vegetable with green leaves and red stems plus a dish of fried chilli peppers. There was more than enough for me as well as the family. When two other guests (a young French couple) returned from their walk they joined in. The standard scrambled egg and tomato dish was added to make sure there was enough - and there was plenty. There was no rain for the first time in days. My guide arrived and after paying the entrance fee we set off. I am so glad I hired a mule. The way is very steep and I am definitely not fit enough to do the climb. The highest point is 2670m above sea level but I do not know how high Qiaotou is. It was scary in places going down. The saddle was wooden covered in blankets with metal hoops front and back to hold onto. Going up I had to lean over the mule's neck. Going down I had to lean right back with my feet parallel to it's neck. Sometimes I was completely vertical! The jolting when the mule went down a very steep section could also be quite hard. It was much faster than I could have done it and except for the strain on the shoulders much easier for me. The guide could have gone much faster on his own though. He was very fit and walked in canvas shoes, no special boots for him. Once we were on the flat middle section I dismounted and walked. Much easier on my bum and I am reasonably fast on the flat. Also the guide carried my backpack. I had expected to take a day and a half but we arrived at my expected overnight stop at 4:00pm with just over an hour to go, so I completed the trek in about 8 hours. This last down stretch was really very steep in places. At one stage I had to dismount as the mule just could not make it with a rider. I climbed down for a short while over the worst part and then rode again. I had already indicated that I was very slow going up and down but fine on the flat. The guide could see from the way I went down that it would be much faster if I rode. Of course the sooner I arrived at Tina's Guest House the sooner he could leave for Qiaotou and home. I assume he went along the road as it would have been much faster. Modern technology is on the trek. We were never out of cell phone range. The guide made several calls during the day. The French couple did it in 7.5 hours and still went down to the river from Tina's, another 1 to 3 hours. Now that is fit! Most people take the day and a half for the trek itself. The views of the gorge are spectacular, well worth the sore bum and every stiff muscle. I have tried my best with the photos but the views just cannot be reproduced by a camera. You have to see it for yourself to appreciate the immensity and grandeur of the gorge. It will be gone in a few years as a dam is being built. 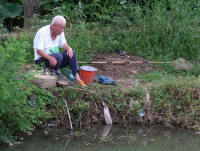 China needs the water and electricity for its growing population and industrial development. The shower at Tina's did not have a shower head, just a hard stream of water pummelling my shoulders. Bliss! I slept to the sound of the Yangtze rushing by down below. I wanted to go down to Tiger Leaping Rock before heading back to Kunming. I felt great, no stiff muscles at all. There is a path from Tina's, built by the family down to the rock and a ladder going up. Legend has it that a Tiger leapt across the Yangtze using this rock. I was offered a guide but refused and set off, Unfortunately I decided that it was not appropriate to pass by the front door of a house (it also acts as the entrance office where you pay a small fee) and ended up doing a short circle. Eventually I agreed to a 6 year old guide for 20 Yuan. Her 10 year old sister came along for the walk. They were worth every penny. Not as guides, you don't need one, but as companions. I thought of them as my little mountain goats. They skipped off ahead, the younger one picking wild flowers. Then they would look back and see me way behind. The older one would wait while the younger one dashed through the brush looking for more flowers. They were great fun to be with. The whole trek took me 3 hours, including ascending the vertical ladder. The views of the rapids close up were once again worth every sore muscle. These lasted several days! Now I had to find transport back to Qiaotou along the road. I was offered an exorbitant price so made it clear I didn't want the whole minivan, just one seat in the minivan. Of course I was told that it would be impossible to find other passengers before morning, so I said I would walk. In any case I wanted lunch first. By the time I was finished another 2 foreigners came up from the river and we managed to get the price down to a reasonable level. Locals were picked up on the way and I guarantee they paid a lot less. Tourist tax always enters the equation. The road wound around the curves close to the river. We had to negotiate around one small slide of rocks, through waterfalls and around one single rock in the middle of the road. A single rock is always more scary than a group for me. When will the next one hurtle down? Once in Qiaotou it was a matter of getting the bus to Lijiang. While I was waiting a minivan owner offered a ride. I decided it would be more comfortable that a rattle trap bus and negotiated a price. A young French man was also waiting and joined me. The minivan went over a different route providing transport for people in more remote areas. It was nice to go a different way. The young Frenchman had previously stayed at Mama Naxi's and said it was a great place. The minivan dropped us as close as possible, better than the bus station, and he guided me in. Lijiang Old Town is pedestrianised. The admin is all very informal. I said I wanted to stay for two nights and was shown some dorm beds, I chose one and left my backpack on the bed. The two of us then went off to the market, he was catching the night bus and wanted to buy some fruit and nuts. We returned to Mama Naxi's and sat with a group to chat. Next thing bowls were set out with chopsticks and tea cups. Green tea poured, rice placed in bowls and dishes of all types of food started arriving. If you were sitting down it was assumed you were going to have dinner - for 10 Yuan! I have never had such a fantastic meal for so little. Pets abound. I saw at least 5 cats and 3 dogs. Next morning I decided to have muesli. It was delicious but huge and kept me going all day. I walked around the old city until I realized that my thighs were complaining badly. The afternoon was spent reading and relaxing. In any case it rained in the afternoon. I had asked the staff to purchase a ticket to Kunming for 10:00 next morning. When I was given the ticket I didn't look at it. There was a huge crowd going off to the gorge so it was only after they left that I was asked when I was catching the bus. It then came to light that the bus left at 9:10 and it was already 9:05! A quick phone call was made, my breakfast which was just ready put into a plastic bag with some extra fruit and I dashed off. The bus left 10 minutes late because of me but at least I made it. The journey was back along the road I had traversed earlier, still picturesque. Pieter was waiting at the hostel. The next few days were spent waiting for the new carnet to arrive from SA. Pieter had already started the process. It was now a matter of trying to find out where in the world it was. The AA uses a 'global' courier with offices in South Africa only. They sub-contract for overseas letters. This makes it impossible to use their tracking system. The carnet eventually arrived late on Friday. We celebrated by having a last coffee and cake before reaching SA, watching Kebab and flower hawkers quickly vacating the large pedestrian mall because the police were coming and hawkers are not allowed. 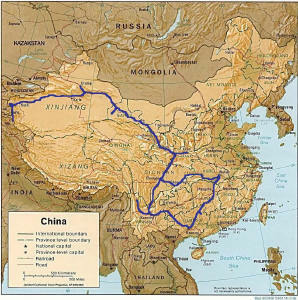 I had planned our trip to go overnight to Chengdu with a 1 night break then overnight to Lanzhou. Unfortunately the trains to Chengdu were few and far between, with hard seats only available for an overnight trip. This is apparently because of the earthquake in Sichuan - doesn't quite make sense to me. Anyway it was better to get a hard sleeper for the two night ride to Xian and a day train to Lanzhou. Once again through narrow fertile valleys and high hills. I saw one interesting roof peak with two dragons facing each other. Usually only the ends are decorated. Unfortunately there was something wrong with the brakes, every time they were applied the whole train jerked. Not good for sleeping! Also lots of loud talking from early to late and a baby with a jealous sister who made the baby scream constantly. Mind you the baby was a screamer to start with. All in all an unpleasant journey. We arrived in Xian at 3:30am and purchased tickets supposedly for soft seat for the 8 hour journey. Miscommunication meant we ended up with a soft sleeper. What Bliss! This meant VIP treatment - into a lounge area with soft seats while we waited. The lounge is also used by railway personnel to sleep at night when they are not required . We were ushered onto the platform before the train arrived so that we were already on the train by the time the plebs arrived - no pushing and shoving. We were the only occupants of a cabin for 4. There is a door which we kept closed and we both slept for most of the journey. It will be back with the plebs for the next journey though. We did exactly the same thing as I had done before in Lanzhou, slept the afternoon away and went to the night market for dinner. Next day I went to the Gansu Provincial Museum. Pieter had already seen it and decided to rest instead. As always the displays were beautifully presented with English labels on most things. There were several halls. Two featured fossils and dinosaurs found in Gansu. There were 5 or 6 giant dinosaurs as well as the usual plant and small animal fossils. Apparently Gansu used to be under the sea, it is now well above sea level. The most interesting fact for me is that the dinosaur Mamenchisaurus Hochuanensis, a vegetarian, was larger than the Sydney Harbour Bridge. It is interesting that this is the comparison used in China. How many Chinese visitors have been to Sydney? The pottery exhibition was delightful. Many of the pieces are 8,000 yeas old from the Dadiwan culture and exquisitely painted. They were a settled agricultural people at this stage growing millet amoung other crops. It is the oldest known painted pottery in the world. Many pots were buried with the dead and have survived intact or nearly so. During the Bronze Age the decoration deteriorated as the climate became drier and the people became semi nomadic. They had less time to spend on decoration. There is one exquisite bronze horse perfectly balanced on one hind leg galloping on a swallow. Poor swallow! It is from the Eastern Han Dynasty (25-220CE) and was unearthed at Leitai in Wuwei City. It is used as a symbol in many places. Including outside Lanzhou Train Station. The Silk Road exhibit related specifically to the role played by Gansu as all caravans travelled through the Hexi Corridor. China imported horses from the west plus Buddhism and the whirling dances of Central Asia influenced the culture. Exports were mainly silk and jade. Interesting trivia -The only rulers to control the entire Silk Road from China to Europe were the Mongols with their unbeatably huge empire. Friday we didn't have to leave until 16:00 so I took the opportunity to visit the White Pagoda Hill. At least it was not raining nor as cold as the previous day. The air still had a nip in it though. White Pagoda Hill was built during the Yuan Dynasty (1206-1368 CE) with many temples and pagodas (still in active use today) and shaded paths. The views are supposed to be good but smog and/or dust made them very hazy. First stop was the Magic Rain Temple with its golden statue of a seated Buddha and decorated roof line with a lion, horse, bird, fish and the usual dragons. The White Pagoda Temple was built in 1228CE during the Yuan Dynasty as a memorial to a Tibetan Llama who died in Lanzhou on his way to pay his respects to Genghis Khan. There are plenty of prayer flags at the base of the Pagoda. The 3 Stars Temple was built in 1456CE during the Ming Dynasty. It enshrines the Lucky Star, Star of Emolument and Star of Longevity, represented by statues and again still worshipped today. I headed for another temple but missed it completely and ended up at the cable car. Since time was running out I decided to descend in the car over large patches of cosmos. One of the best parts of the excursion was to watch people on the beach near the bottom of the cable car. 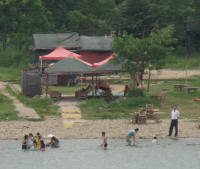 Yes there is a beach on the Yellow River! It is not used for swimming though (all that mud YUK!) but as a general recreation area. There are great opportunities for tourists with speed boat or raft rides along the river and an exercise area, similar to those seen in Turkey. Last time I did not see a mountain pass, this time I was awake when we passed through. We booked into a hotel right next to the station and since time was limited I headed for the Xinjiang Autonomous Region Museum. Pieter spent his time relaxing again, it is doing him good to rest. He is becoming perkier each day. I showed the bus driver where I wanted to go and he was about to drive off with an almost empty bus when suddenly people from the trains with all their luggage climbed on board. It was crowded and chaotic within seconds. At first the city gives the impression of being 3rd world only clean. The buildings are old and not maintained. Then in the distance many new buildings could be seen. It seems I went through the poorer section of town. There is quite a lot of advertising and signs in Cyrillic, presumably Russian or perhaps a Central Asian language.. When I arrived at the museum, the driver had to shout at the passengers to move aside so he could tell me to get off. I then discovered that tickets are given out at specific times. I had to wait almost an hour. The tickets were free but time was now limited. The first stop was the mummy exhibition. The dry conditions meant that graves and their contents were well preserved. I had to join a tour group for this as the section was closing. This was OK. It meant there were no guards patrolling to ensure photos were not taken - but I am a normal tourist and I do not always stay with the tour guide. Interestingly cremation was used in 1,000 BCE. Stone statues were erected at the end of the grave and the bodies were buried in coffins with various objects. The Loulan Beauty with European features from the Tieban River graveyard (1800 BCE) became something of an independence symbol for the Uighur community in the 1990's. The exhibition includes a mummy of mixed European and Mongoloid features (800BCE) as well as a photo of a rich merchant (25-200CE) from Yingpan Cemetery wearing a hemp mask decorated with gold leaf with Greek motifs on his jacket, Persian motifs on his pants and Chinese shoes, definitely an international dresser. The exhibition about the revolution (I assume) had no English captions so that was an in and out for me. The Silk Road Exhibit is apparently very good. The entrance is through a corridor over glass with sand and stones underneath, painted mountains on the walls and stars overhead - quite innovative. There were plenty of English explanations but I did not have time to read them. The guards were constantly around as they wanted to close up in 10 minutes, so only one photo. It would have been nice to spend time there. There were bronze and lead wind goggles from the Tang Dynasty (618-907CE). They would have been a great help when the sand laden wind blew. We saw a storm off to the south, bringing snow to the highest peaks. It will probably be cold crossing over the pass into Pakistan. Kashgar was not the same. It was dead. I can only assume this was because it was Saturday as the next day it was lively again, presumably because it was the 14th, the day of the Autumn Festival. It is the month of Ramazan so all the action only happens after the sun has gone down. My standards have changed after visiting other parts of China. When I arrived it seemed so clean compared to Pakistan, now I see that it is not as clean as Eastern China. The hotel is run down and charges the same price as back east, but it is well maintained compared to Pakistan and India! 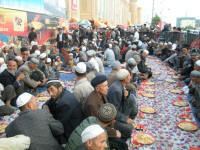 The Uighurs are still surly though. 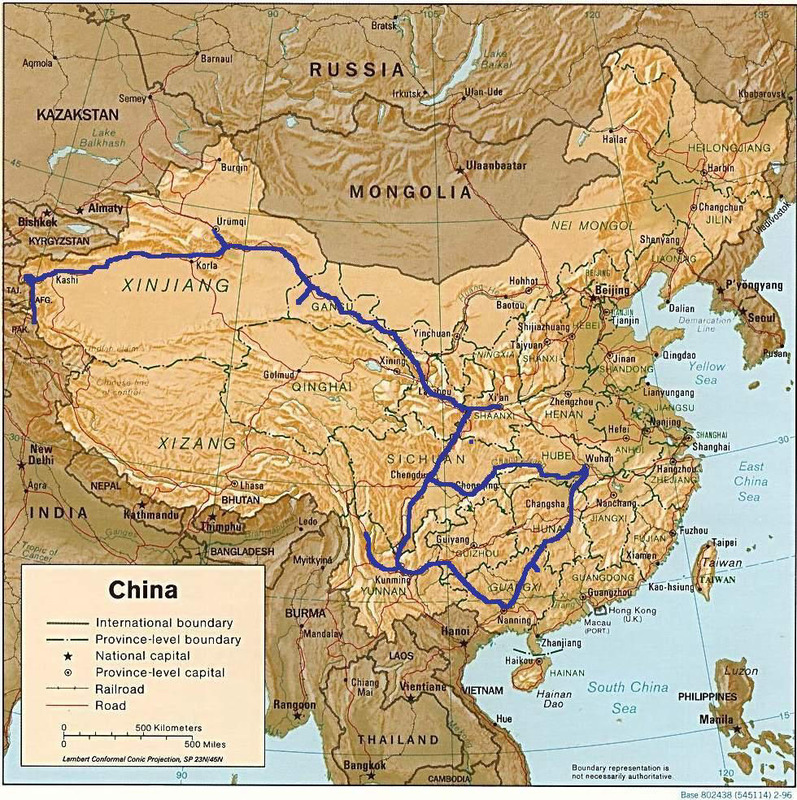 This area can be classed as a transition between countries to the west and the main section of China. 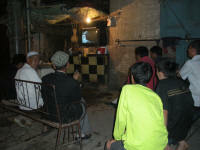 After an afternoon of relaxing we spent the next two days updating the website and enjoying Kashgar. 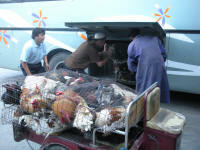 We booked a ticket from Kashgar to Sost with an overnight stay in Tashkurgan. What a disappointment! It was a sleeper bus for two day trips. You could only recline as your feet went into a space under the head of the person in front. No matter how you recline, if you want to see the scenery your neck aches from being in a very uncomfortable position. Pieter chose to sit with his back to the window as that was the only way he could be comfortable. It was his first experience of a sleeper bus. His reaction was the same as mine after my first experience - NEVER again. Just shows you can't say Never! The closer we came to Tashkurgan the colder it became. I suppose I could have requested my luggage with my warm clothes when we reached Tashkurgan but it was buried deep under other luggage. I had actually expected all the luggage to be removed, just as well the hotel provided soap, toothpaste and toothbrush. Pieter was much better prepared for the circumstances. He had a warm top and toiletries in his day pack. Next morning he managed to get his warm jacket out for me. It was too cold to wait for the customs hall. At least we had padkos (food for the trip) with us and ate a reasonable breakfast and lunch. Right at the start of my China adventures I took this scene with a tourist and a guard in it. There was no snow then! It was snowing somewhere nearby for most of the trip to Sost, and cold. At least the bus was warm and once again we had padkos.